So without further ado, this month’s MashUp patterns are the Johnny B Good Hoodie from Shwin Designs and the Bond Top from Beatnik Kids. Yes, it’s a unisex pattern MashUp! 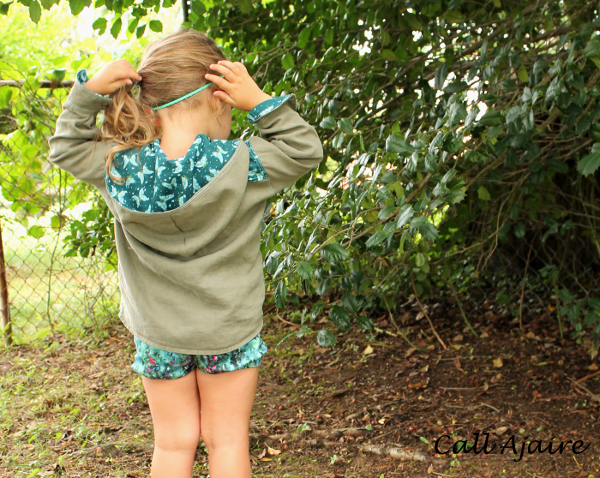 The Johnny B Good Hoodie is a button up meant for boys, but it’s super cute on a girl too. There is a classic option with a collar or you can make the hooded version. Optional shoulder patches and pocket, along with the short or long sleeves allow you to further customize the look. 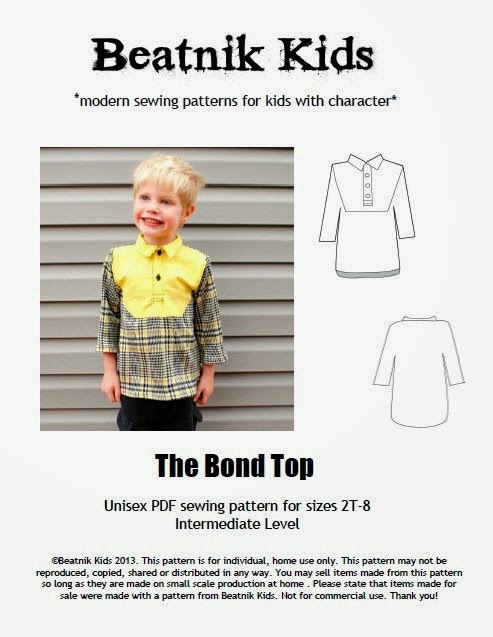 Shwin Designs‘ instructions also include how to repurpose an adult button down shirt so you don’t even need to tackle all those buttonholes. The size range is 12-18M through 8 years. 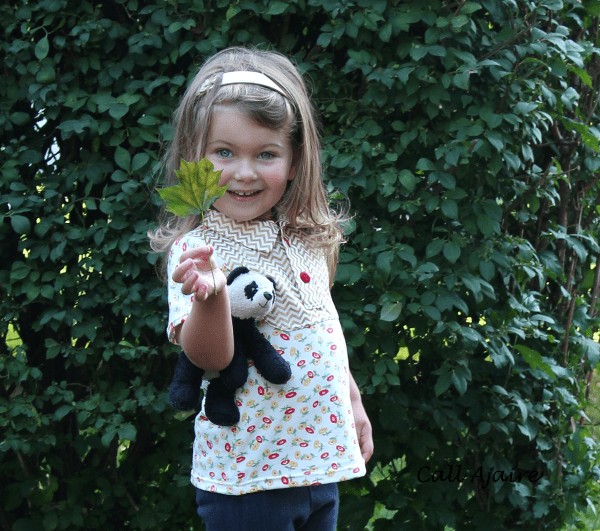 For Bean’s size 3T Johnny B Good I used one of her father’s old shirts and some fun butterfly fabric that she loves. The shoulder patches are my favorite part. 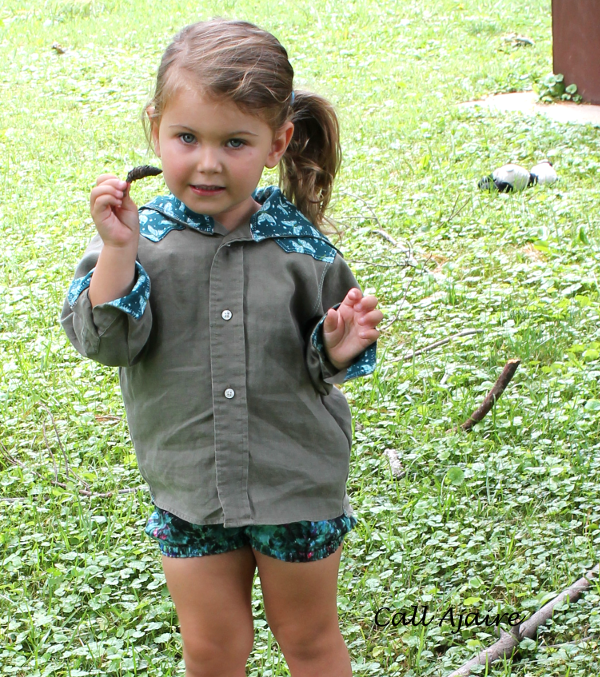 The hood lined with the same butterfly fabric makes this shirt a great layering piece. Here she is wearing it over her (finally named) Paneled Sunsuit. I also used the butterfly fabric on the inside of the sleeve cuffs since I knew I wasn’t going to keep the cuffs closed with a button. The lining fabric makes the open cuffs look more intentional. For all of the details in this shirt (like the topstitching), it came together quickly. The instructions are clear and the step by step photos made it easier to understand how everything would go together. I love how this shirt turned out for Bean and even though it isn’t super girly and pink she wanted to keep wearing it all day. Of course she insisted on the boots too though, hehe. 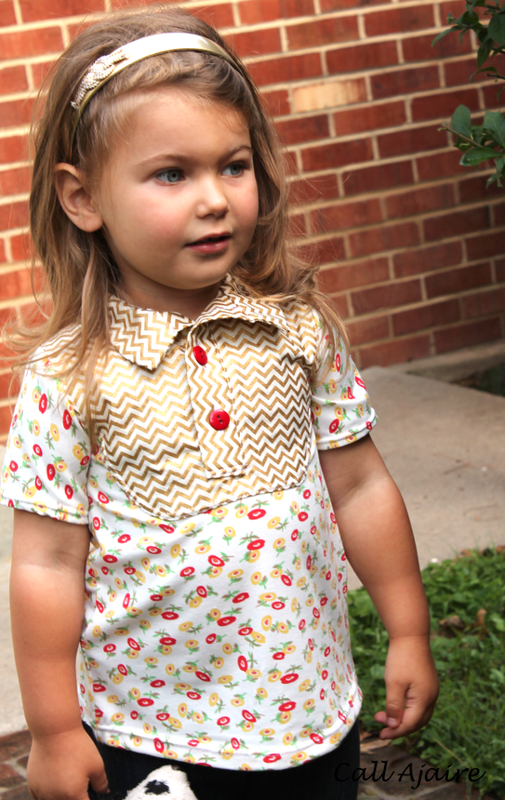 The Bond Top is Stacey from Boy, Oh Boy, Oh Boy‘s first pattern for sale through her Beatnik Kids pattern line. This three quarter length sleeved, knit shirt has a bib front that can be made with woven fabrics for a fun contrast. I love mixing knits and wovens and this design is perfect for that. 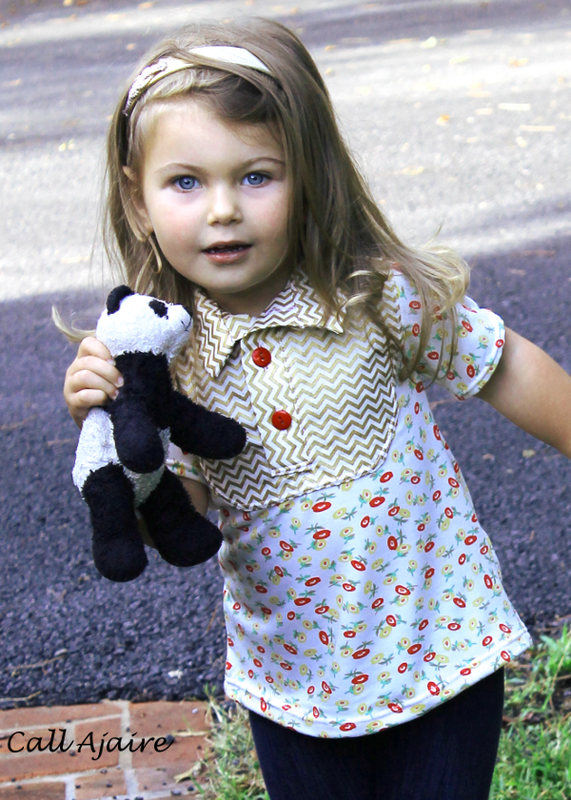 The button placket and collar are all business, but the ease of wear from the knit and slight high-low hemline make this top great for play too. The size range is 2T through 8 years. I used a Girl Charlee floral fabric for the knit portion and I only had enough left of it to make a short sleeve so I just shortened the pattern’s sleeves a bit to accommodate the lack of fabric. The 3T size fits Bean just right. The bib is made with a quilting cotton from JoAnn that I had in my stash. I think it’s a fun combo with the floral. The red buttons are a probably my favorite part. I adore how this shirt feels a bit polished while still being super comfy for Bean to wear. This is definitely a pattern we’ll use again and again. So are you excited for the MashUp of these two patterns yet? If you’d like to Mash-a-long next week then you’ll need the Johnny B Good Hoodie pdf pattern which can be purchased here and the Bond Top pdf pattern which can be purchased here. Enter the giveaway rafflecopter below for a chance to win both pdf patterns which have been generously donated by the designers. A winner will be chosen and announced on Monday, July 22nd. Are you kidding? I am in love with both of these tops! I have the johnnie b good hoodie pattern and I love your mix of solid fabric with touches of print. And the beatnik top is just the cutest! Next week is super busy for me so I'm sad I won't get to sew-a-long. Well that's the great thing about sew-a-longs April! They will be there whenever you get the chance to participate. 🙂 I'm really in love with how these two tops came out, but the mashup is awesome too! Holy smokes! 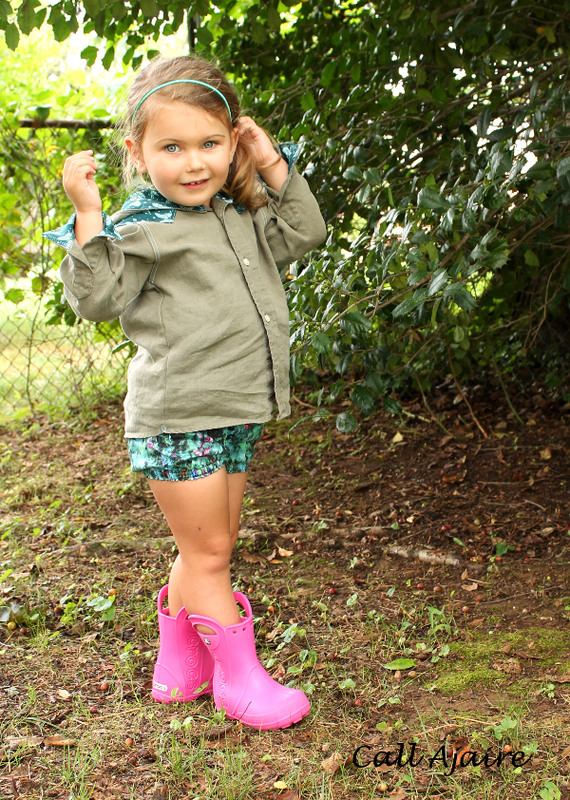 The jacket & shorts are adorable-perfect for this crazy weather we're having lately too. And the top is my fave!! !cool that your having a mad halo g. I can't wait to see what pops up.